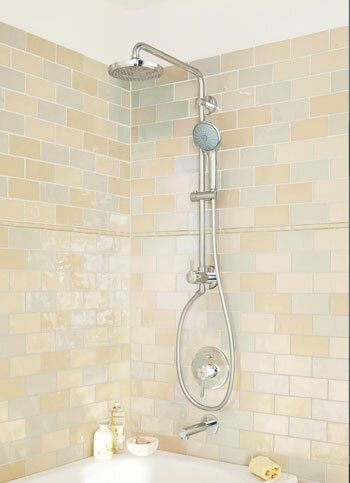 Replumbing isn’t needed with Grohe’s retrofit shower set, which combines a standing rain-style showerhead with a handheld shower. The handheld shower is easy to use, even if a person has reduced mobility, and simplifies chores such as washing a pet and cleaning the shower. 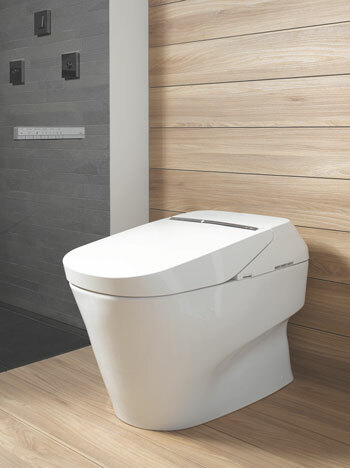 The Neorest 750H by Toto is a high-tech toilet with many desirable features, ranging from a heated seat and deodorizer to a special glaze that teams with an integrated ultraviolet light to break down dirt and grime in the bowl. Wise product choices deliver worry-free function and long-term satisfaction. 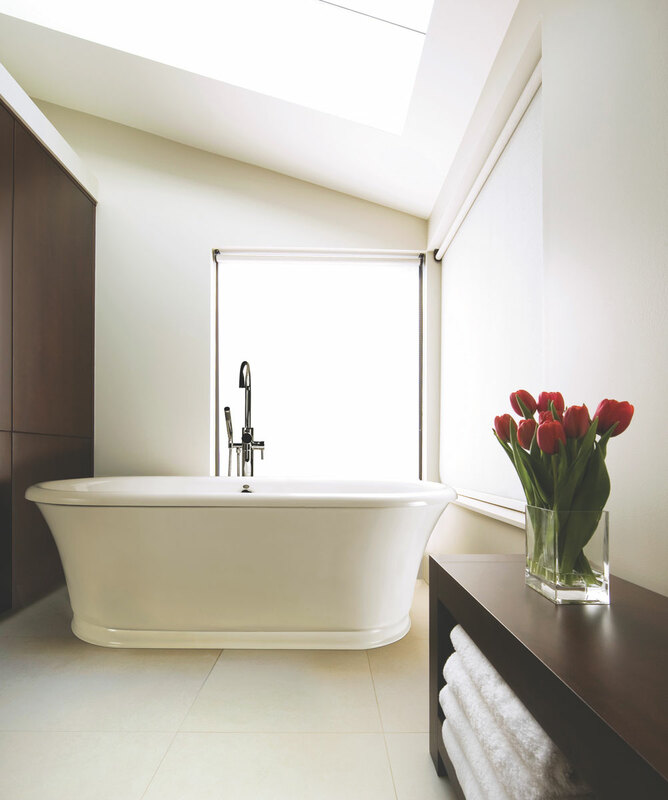 In this issue, The Carefree House gives tips and insights about durable luxury bathroom fittings. DNJ: How can consumers purchase bathroom fittings with longevity in mind? 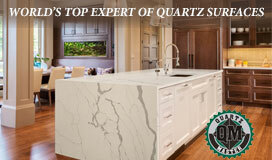 Lorenz: When it comes to faucets, make sure your selections have ceramic disc cartridges and brass construction. These quality materials will ensure longevity and non-drip operation. You can save a few dollars initially on faucets with plastic interiors, but you’ll pay in the long run with additional maintenance for drips and shorter product life. Tubs and showers are made of several materials, with solid surface/stone composite being top-of-the-line. Acrylic is also highly desirable and popular. Brands such as MTI are a perfect example of exemplary materials and construction. MTI manufactures every tub made-to-order in the United States, and its Designer Collection tubs offer a lifetime warranty. To keep your toilet cleaner longer, pick one with an antibacterial coating. Typical warranties on mechanical parts in a toilet run from two to 10 years, the latter of which are available with higher-end American Standard models. On bathroom sinks, choose ones with higher-end glazes, which you’ll see on brands such as Duravit and Toto. These will help your sink stay gleaming-clean longer. DNJ: What if you have corrosive water? Lorenz: If you have corrosive or hard water or have a lot of sediment in your water, select a showerhead with easy-clean nozzles, which let you clear out any debris that is causing clogging. A brand such as Hansgrohe has silicone nozzles, which are perfect for anyone with challenging water. Look for faucets with brass construction—and that’s solid brass metal, not a brass finish. These are less susceptible to corrosion. A drain comes with every faucet. Make sure the drain itself is metal. If it has plastic construction with a metal finish, corrosive water will cause the metal finish to peel or break down over time. DNJ: Is there a classic metal finish in bath fittings that is less likely to appear dated after several years? Lorenz: Polished chrome is the classic finish and always the best-seller. Even when a certain finish is trending for months or even a few years, polished chrome always outsells it. DNJ: Can you explain PVD (physical vapor deposition) finishes? Lorenz: PVD finishes are now fairly common. Polished brass faucets installed in the 1980s peeled and disintegrated over time. By the early 2000s, PVD finishes were being used, and those brass faucets still look good today. PVD finishes last longer and don’t pit or peel. A faucet with a PVD finish has a lifetime warranty. These are commonly found on polished or brushed brass. Chrome is manufactured with a totally different process and doesn’t require PVD. DNJ: Is there a caveat with rain-style showerheads? 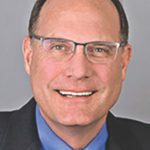 Lorenz: When customers come into Frank Webb showrooms requesting a rain-style showerhead, we start by discussing their expectations for their showering experience. Lots of people love the look but don’t realize that rain showerheads will always mean lower pressure and wider body coverage than traditional showerheads. We sometimes work with couples who want different types of body sensations in their shared shower. In those cases, we recommend a shower with two showerheads, one jetted and one rain-style. This is a situation where actually being able to experience working displays—where you can feel the difference—is key. DNJ: Please give tips for outfitting a bathroom now so it won’t need a major renovation if someone later develops physical challenges. Lorenz: We are very interested in sharing knowledge about accessible design, Americans with Disabilities Act standards and aging in place. This is often referred to as living in place, not aging in place, because many of these bathroom products work as well for a 15-year-old recovering from a broken leg as an 80-year-old with arthritis or other physical challenges. The following products are available in any style and finish you can imagine so they won’t detract from your bathroom. First, lever faucets: These use less force to turn and can be as handy for a youngster learning to use the bathroom alone as for a senior who is losing hand strength. Next, handheld showers: These are great when you have children or need to bathe pets, clean feet, wash out buckets, spray down shower walls or shampoo your hair. Grohe makes a shower system that combines a showerhead and handheld shower in one unit, replacing an existing showerhead with no additional plumbing. It is a simple, cost-effective upgrade. 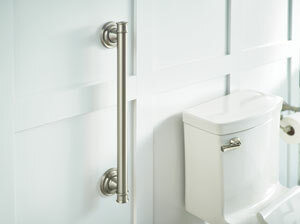 Finally, grab bars: They can be retrofitted with brands such as Moen Home Care, which features a special “secure mount anchor” that allows you to go through an existing wall to anchor a grab bar. But it’s always preferable to plan for grab bars and have your layout designed so a stud will be where you need it, whether now or later. DNJ: What high-tech innovations are here to stay? Lorenz: Companies such as Steamist have engineered digital showers that let you program the water’s pressure and temperature for each person so there’s no recalibrating when you enter. They also provide aromatherapy to add fragrance for relaxation or invigoration during your steam shower experience. And with chromatherapy, you can turn on a spectrum of six steam shower lighting effects to bring about positive physical or psychological change. Toto offers toilets with heated seats, self-cleaning technology, bidet settings and more. Equally exciting are bathroom cabinets from manufacturers such as Robern, which have USB charging stations and LED lighting plus Bluetooth capability for an efficient morning routine. DNJ: How can shoppers be sure they’re buying long-lasting bath fittings? Lorenz: You can find quality at many price points, but it’s not always evident. To shop with confidence, seek out showroom consultants who aren’t on commission so they don’t have any hidden agenda, and work with them to learn where the tradeoffs are. That way you can make your budget go further while getting the desired results. Many people find Houzz and Pinterest photos showing bathrooms that look the way they want, but they often don’t consider the experience provided by those fixtures. Factors such as water pressure, ease of use, innovative storage—none of these can be seen in a photo but really impact your satisfaction with the project in the end. Mary Vinnedge, Design NJ’s first editor, freelances from her coastal home.